Railpictures.ca - Julian Bernard Photo: Toronto Transportation Commission 411 is southbound on the North Yonge line nearing the crest of Hogg’s Hollow hill; in a few moments it will swing east across Yonge Street into the Glen Echo terminal located at what was then the boundary between North York and Toronto. After the closure in 1930 of the former Toronto & York Radial Railway which extended from Toronto to Lake Simcoe, the townships of North York, Markham and Vaughan and the town of Richmond Hill banded together to acquire the southern 10 miles of the line to be operated by the TTC. Except for street running through Richmond Hill, the entire route was on a private right-of-way, most of it on the side of the road. Operations ended, replaced by buses, one week after the photo was taken, on October 10, 1948. This photo appeared in Railroad Magazine in a 1949 story about the closure of the last remnant of the Toronto & York Radial Railway and in a 1980s calendar of the Upper Canada Railway Society. | Railpictures.ca – Canadian Railway Photography – photographie ferroviaire Canadienne. Copyright Notice: This image ©Julian Bernard all rights reserved. 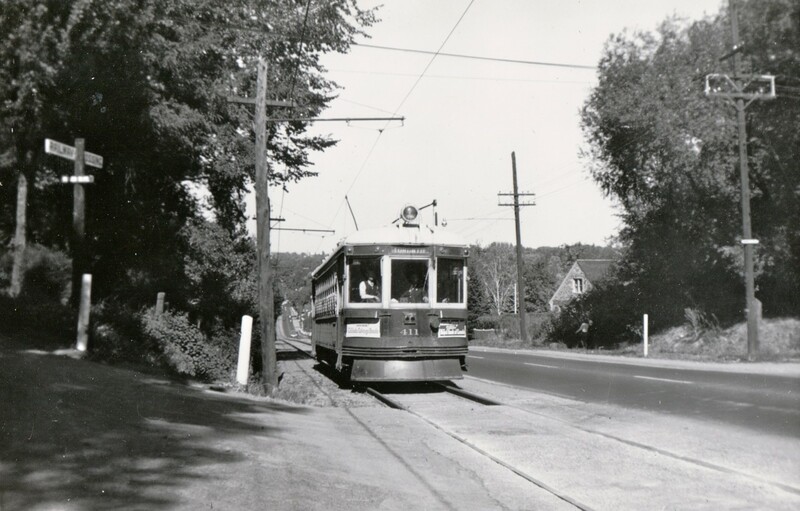 Caption: Toronto Transportation Commission 411 is southbound on the North Yonge line nearing the crest of Hogg's Hollow hill; in a few moments it will swing east across Yonge Street into the Glen Echo terminal located at what was then the boundary between North York and Toronto. After the closure in 1930 of the former Toronto & York Radial Railway which extended from Toronto to Lake Simcoe, the townships of North York, Markham and Vaughan and the town of Richmond Hill banded together to acquire the southern 10 miles of the line to be operated by the TTC. Except for street running through Richmond Hill, the entire route was on a private right-of-way, most of it on the side of the road. Operations ended, replaced by buses, one week after the photo was taken, on October 10, 1948. This photo appeared in Railroad Magazine in a 1949 story about the closure of the last remnant of the Toronto & York Radial Railway and in a 1980s calendar of the Upper Canada Railway Society. By Halton, assuming you mean the OERHA museum which is “just around the corner”, surprisingly little. As for the Niagara, St. Catharines & Toronto, yes I do have some, the earliest from 1948, which I will try to post sooner rather than later. OMG, as the youngsters say!!! Makes me want to ask if you have anything pertaining to Halton or Niagara!! !